‘It is but a step from the Sleeping Wood to the magic glades of Tir nan Og, the Irish fairyland, where glad hearts find eternal youth, and where the Little Good People stay safe and sheltered. This is the trailer for Beauty and the Beast a film on my ’to see list’. I love the richness of the story and the visual images of glowing costumes and scenery. I want my blog to be rich and colourful and filled with all things French. With Paris and Gothic and mystery and literature and the 19th century; this video is all these things. I have always felt a connection to France. Of course, my own wonderful homeland of Australia: the bush and the Indian Ocean coastline where I have a house in Western Australia (Tim Winton country) is the true country of my heart. Louise Brooks: she could have stepped out of the past and not looked out of place in the modern world. She was a brilliant actress and also a writer. Harold Chasen (Bud Cort) is a young man obsessed with death. He regularly stages elaborate fake suicides, attends funerals, and drives a hearse, all to the chagrin of his mother, socialite Mrs. Chasen (Vivian Pickles). 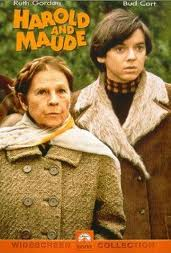 At a funeral service for a total stranger, Harold meets Maude (Ruth Gordon), a 79-year-old woman who shares Harold’s hobby of attending funerals. He is entranced by her quirky outlook on life, which is bright and excessively carefree in contrast with his own morbidity. The pair form a bond, and Maude slowly shows Harold the pleasures of art and music (Harold is taught to play banjo), and teaches him how to ‘make the most of his time on earth.’ Meanwhile, Harold’s mother determines much against Harold’s wishes, to find him a wife to settle down with. One by one, Harold frightens and horrifies each of his appointed dates by appearing to commit gruesome acts such as self-immolation, self-mutilation, and seppuku. As they become closer, Harold announces that he will marry Maude, resulting in disgusted outbursts from his family, psychiatrist and priest. Maude’s 80th birthday arrives, and Harold throws a surprise party for her. As the couple dances, Maude tells Harold that she ‘couldn’t imagine a lovelier farewell.’ He immediately questions Maude as to her meaning, and she reveals that she has purposely taken an overdose of sleeping pills and will be dead by midnight. She restates her firm belief that 80 is the proper age to die. Harold rushes Maude to the hospital, where she is treated unsuccessfully and dies. In the final sequence, Harold’s car is seen going off a seaside cliff, but after the crash, the final shot reveals Harold standing calmly atop the cliff, holding his banjo. After gazing down at the wreckage, he dances away, picking out on his banjo Cat Stevens’ ‘If You Want to Sing Out, Sing Out’.